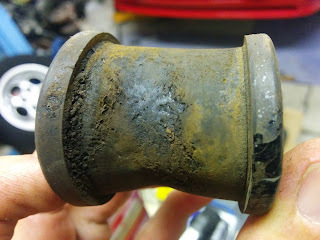 When I bought my bargain £250 VW Golf I noticed on the test drive that there was a knocking/banging noise coming from the front suspension when you went over bumps. The owner believed it was the shock absorbers but from my checks on the car I thought it was more likely to be the front anti roll bar bushes. The car settled immediately if you pushed down on each corner and the top mounts appeared to be in order. I also noticed that on a previous service it was reported that the ARB bushes were worn and there was no evidence of them being changed subsequently. Sure enough when I jacked the car up to check the ARB bushes were well worn and the ARB had plenty of play within them where the centre diameter had expanded over time. The bushes had also hardened considerably so they didn't absorb movement very well. The new ARB bushes were a very cheap fix at only £6 for the pair. Fitting them was a pain until I got a pair of G-clamps to hold the bush mount in place to allow the bolt to tighten it. As the new bush is so much bigger it makes it a squeeze to fit the clamp over it but it is possible if you take your time. The difference in the way the car drives is amazing, there is no longer any suspension noise over bumps and the car feels much more planted around corners. Definitely a job that is well worth doing if your car still has the original anti-roll bar bushes fitted.